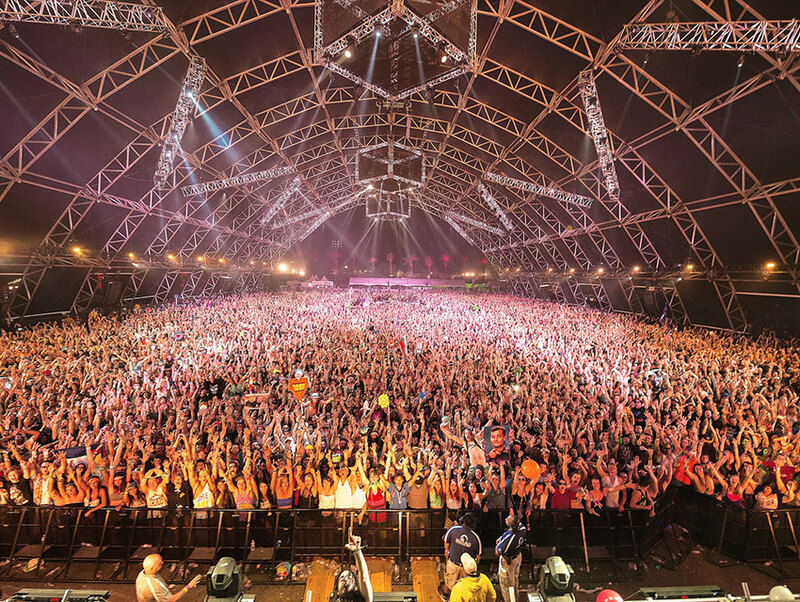 It’s October and although the heat is lingering, the music festival season is drawing to a close. This summer, Angelenos had a number of ways they could get their fest on. From massive and massively sponsored productions like Made in America to boutique gatherings like Tarfest, there was something for everyone. This isn’t technically a Los Angeles festival, but we’d be remiss to exclude the jewel in Southern California’s festival crown. This year saw the Outkast reunion (complete with a stuffed polar bear) and headlining sets by Muse and Arcade Fire. It also featured the best cameos: Justin Bieber (yeah, we know), Debbie Harry, Gwen Stefani, Nelly, Busta Rhymes, and Beyonce, who joined her sister Solange. Despite sand storms, the risk of heat stroke, and an increasingly commercial culture, the desert bash is still the best festival around. The diversity of the assorted acts, including some of the biggest names in the world, is hard to beat. And the event’s organizer, Goldenvoice, has festival management down to a science. Jay-Z’s next take-over-the-world production hit downtown’s Grand Park for the first time over Labor Day weekend. The lineup included John Mayer, Kendrick Lamar, Iggy Azalea, Weezer, Imagine Dragons, and Kanye West, which sets the bar high for next year. While there were no serious disasters, the day wasn’t without its problems: too many queues on the pathways, visibility that was hampered by camera cranes and city structures, poor placement of amenities. The startup woes can be easily remedied, and if they are, we expect Made in America to grow exponentially in the next few years. Until Made in America gets its sea legs, FYF is still the preeminent music festival in L.A. proper. This year it brought us the return of The Strokes and Interpol as well as Phoenix, Haim, Grimes, and The Blood Brothers. Organizational blunders crippled the first day of festivities (this isn’t a new problem for FYF), but after organizers pulled an all-nighter to tighten the plan for the second day, FYF pulled off a comeback matched only by The Strokes. Jane’s Addiction headlined the first day, celebrating the 25-year anniversary of its pioneering record, Nothing’s Shocking. Other acts included Empire of the Sun, Failure, and Crosses (†††). For the first time, hip-hop was represented at the event with rapper Murs curating a mix of acts on an outdoor stage that bore his name. This festival is unique in that concertgoers not only get to experience headliners and other acts outside on the Strip, but iconic venues such as the Roxy, Viper Room, and Whisky-A-Go-Go open their doors to host live entertainment and surprise guests throughout the weekend. Abandoning the big-box festival model, Echo Park Rising completed its fourth year as a showcase of up-and-coming, independent, and local acts. That alone makes the festival worth attending. It also does a good job of incorporating restaurants, stores, and other Echo Park businesses, giving the whole thing a strong neighborhood-centric vibe. Plus, you don’t need a payment plan to buy tickets; a two-day VIP pass costs approximately $25. Echo Park Rising isn’t the only festival dedicated to spreading the local love. Tarfest, which just finished its twelfth and largest year, is organized around the La Brea Tar Pits by Launch L.A., a non-profit dedicated to serving emerging artists and making culture more accessible. It’s also one of the only festivals without any price tag. Music is only part of the appeal. Bands like Hunter Hunted, The Moth & The Flame, and DWNTN were accompanied by live painting, silent auctions, and events at the Page Museum. It’s a perfect choice for those who want a family-friendly festival where kids won’t get swept away in a sea of Budweiser. Summer festival season may be over, but only because the calendar says we have to change “seasons.” HARD hosts events around the country, sharing its glittery, glow-stick vision EDM to all. It returns to SoCal on October 10 with Night Bass headlined by Jack Beats and on November 1-2 with a Day of the Dead festival at the Pomona Fairplex. The latter will feature Knife Party, Pretty Lights, Diplo, Calvin Harris, Deadmau5, Bassnectar, and dozens of others. The Way Over Yonder Festival (September 26-27) brought a mix of folk, Americana, and indie rock lineup to the Santa Monica Pier with a roster that included Lucinda Williams, Jackson Browne, and Local Natives. Supersonico (October 11), the Coachella of Latin music, debuted with a roster of more than 20 including Chilean hip-hop-per Ana Tijoux, Mexican rock veterans Cafe Tacuba, and Angeleno troupe La Santa Cecilia. Culture Collide (October 16-18) brings together performers from more than 20 countries—The Oaths (Mexico), Go Back To TheZoo (the Netherlands), Fractures (Australia), De Lux (United States)—for an eclectic cultural experience. Later this month Festival Supreme (October 25), organized by Tenacious D rockers Jack Black and Kyle Gas, brings a lot of comedy and a little music to the Shrine. Overseen by Tyler, the Creator, Camp Flog Gnaw Carnival (November 8) takes over the L.A. Coliseum for its third iteration, complete with midway rides as well as a roster of Odd Future-adjacent acts and emerging rock bands headlined by Pharrell Williams.